Kitchens are a focal point of every house, it’s an area used for all occasions, from feeding the family to entertaining friends. Kitchens are an area in which classic design can be used to full extent to breathe life into an entire house and show character and charm. Having a design makeover of a kitchen can be a costly and time consuming venture, from deciding what doors to have through to making a decision on what area to place the sink. There are a few areas that can give the look of a lovely kitchen and some classic inspiration. Simple design can be a great way to achieve a timeless look, from hiding the clutter and giving a contrast between the colour choices you can maximise the impact to give the focus on the simplicity of the kitchen. To create a design of simplicity you have to make the complex seemingly invisible and done correctly can give great results. Designing a kitchen around a trend can be a risky choice and can date extremely quickly. Making sure you are aware of the trends, from granite worktops to white wood, and use them appropriately. Using trends correctly and as inspiration can give you the edge, while still maintaining the idea of a timeless design. Think creative when it comes to storage. There are tonnes of options to storing utensils, plates and everything else, sometimes having just a cupboard might not fit the bill – be creative with the space available. There is a multitude of ways of using space more effectively, such as those pictured. Any small spaces that you cannot see a use to, try a storage solution that’s out the ordinary. Choose high quality appliances where you can. Quality appliances that fit the design of the kitchen can be a great way to ensure the kitchen is as practical as possible and gives you flexibility when it comes to utilising the kitchen to its maximum extent. Ensuring that the appliances are part of the design can be a key planning decision to make sure the installation goes as smoothly as possible. Using built in appliances can give you as much counter space as possible and remember there’s no such thing as having too much counter space in a kitchen. When you’re planning a kitchen think about the use of the space. A utility room is a great way of hiding the bulky washing machine and tumble dryer away from depreciating the design of your kitchen. A utility room also gives you a great space to use for practical jobs from doing the washing to a place to store muddy wellington boots! 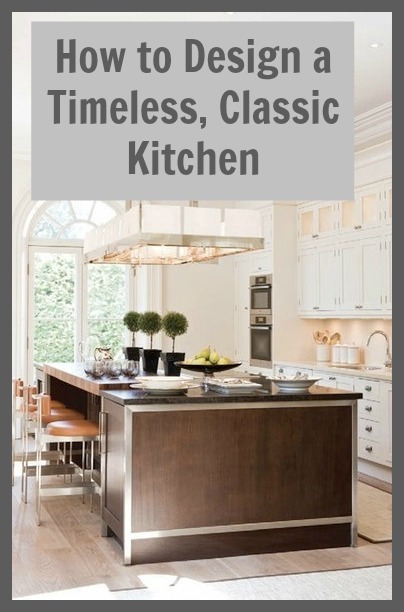 While these are just a few ideas, there are plenty more out there to help you create a timeless kitchen design for your home, think simple, but think big and look the for the right way to design the perfect kitchen. This post was written by Dan Sharp at Glotech Appliance Repairs – serving London with appliance repairs. Great tips, kitchen are becoming more and more important in family life, I know we spend the majority of time in ours! I love my kitchen as this is the place where I spend my most of the time and thus for making it beautiful I am always seeking for advice that could help me in making my kitchen the best and the beautiful kitchen. Now I think I came across the right post, you ideas sound awesome and I loved this kitchen design. I will definitely implement your tips when I do my kitchen decoration. Jen…I am inspired by you and found myself lucky to have your beautiful ideas with me.